centuries. Cocoa butter is the natural fat from a cocoa bean. 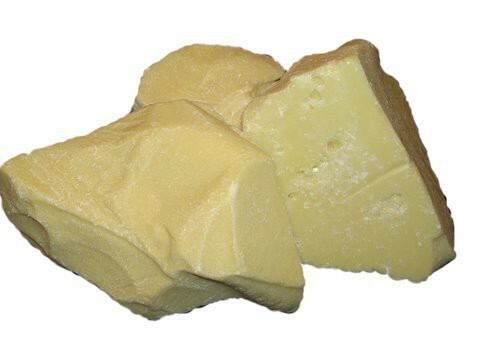 The extracted fat, light yellowish in color, is edible, with a chocolaty flavor and scent. Pure cocoa butter is used in skin care moisturizing lotions and creams. It is often used in body care lines as the main ingredient in body butter creams and soaps. Skin care products that are designed to prevent and help treat stretch marks often feature pure cocoa butter as the primary ingredient. Pure cocoa butter has been recognized for centuries as the ultimate emollient ingredient for keeping the skin supple. It is able to absorb into the skin easily because of its tendency to melt at body temperature. It also has strong antioxidant properties and benefits the skin by protecting it from harmful environmental factors. chocolate, cosmetics, tanning oil, soap, and a multitude of topical lotions and creams. Cocoa Butter has been called the ultimate moisturizer, and has been used to keep kin soft and supple for centuries.